Please CLICK HERE for the current dress code. Members are to maintain a standard of dress commensurate with the dignity of the Club and are to ensure that their visitors maintain the same standards. The professional shop staff, management, clubhouse staff or any member of the Board may refuse access to the course and/or clubhouse to any person not complying with the minimum standards. The mere fact that a person’s dress complies with these regulations does not necessarily mean that it is acceptable. Smartness, neatness and cleanliness are the inflexible standard. Clothing must be appropriate for golf and within the clubhouse. Shirts must have collars and sleeves with no bold advertising motifs; polo/mock collars and skivvies are acceptable. Shirts must be tucked in at all times on the golf course. Tailored trousers and shorts including cargo style are permitted and must be worn with a belt. Pants with full elastic or drawstring waists and denim are not permitted. Socks must be plain white or plain white with a golf club or sports logo. Golf shoes (Non-metal spiked) are essential for play. Clothing must be appropriate for golf and within the clubhouse and shirts must be collared and tucked in unless designed to be worn out. Polo/mock collars and skivvies are acceptable. Denim is not permitted. Golf shoes (Non-metal spiked) are essential for play. 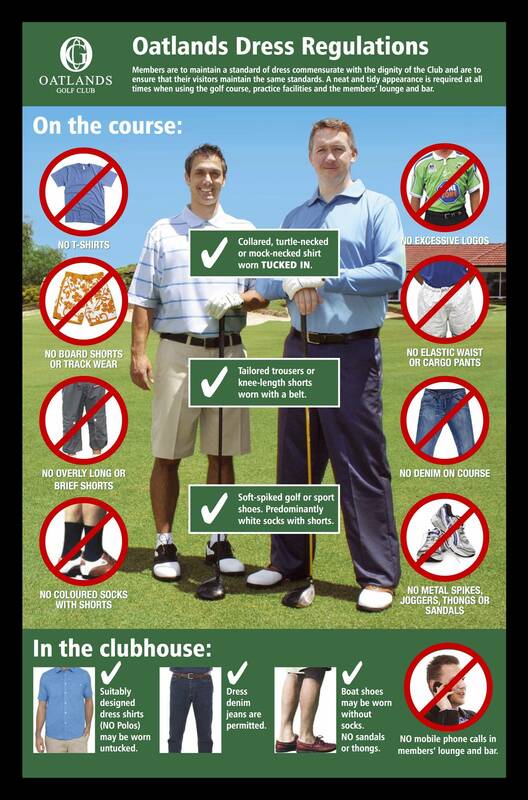 Smart casual wear including dress denim jeans and skirts may be worn in the clubhouse. Dress collared shirts are permitted to be worn un-tucked providing they have been fitted or designed to be worn in that manner. Torn or untidy clothing will not be permitted at any time. Non-metal spiked golf shoes are acceptable. Socks are optional with boat shoes. In the dining room, jacket and tie or smart casual wear is acceptable. Special function notices may prescribe particular attire. If any guest’s attire does not meet the above minimum standards, they will be politely asked to purchase suitable clothing from the Professional Shop.